A. REGISTRATION / ENTRY & OTHER ACTIVITIES AT KDWP. (a)Registration fee for stevedoring-Rs.12,600/-, Valid for 4 years with security deposit of Rs.18,500/- and thereafter fee of Rs.3,150/- for renewal for a period of 4 years in the KDWP. (b) Registration fee for undertaking steamer Agency – Rs.12,600/- for a period of 4 years with a security deposit of Rs.18,500/-and thereafter fee for renewal Fee of Rs.3,150/- and valid for 4 years. (c) Registration fee for undertaking clearing/forwarding works is of Rs.12,600/- Period of 4 years with a security deposit of Rs.18,500/-and thereafter fee of Rs.3,150/-for renewal and valid for a period of 4 years. i) Ship Chandlers, Ship repairing/chipping and painting, Surveyors & other services Rs.12,600/- Period of 3 years and thereafter fee for Rs.12,600/-for renewal for a period of 4 Years. For the category of ‘Ship repairing/chipping and painting’ can be issued only after Complying with the criteria mentioned below under Item –ii. ii) Firms intending to carryout ‘Ship repairing/Chipping and Painting’ works needs to obtain a ‘Registration certificate’ from M/S. Sembmarine Kakinada Ltd considering their nature of work if involved/overlapping with the upcoming ship repair/shipyard activities at KDWP. In case the said firm’s nature of work is different and does not overlap/involve with the work scope of M/S. 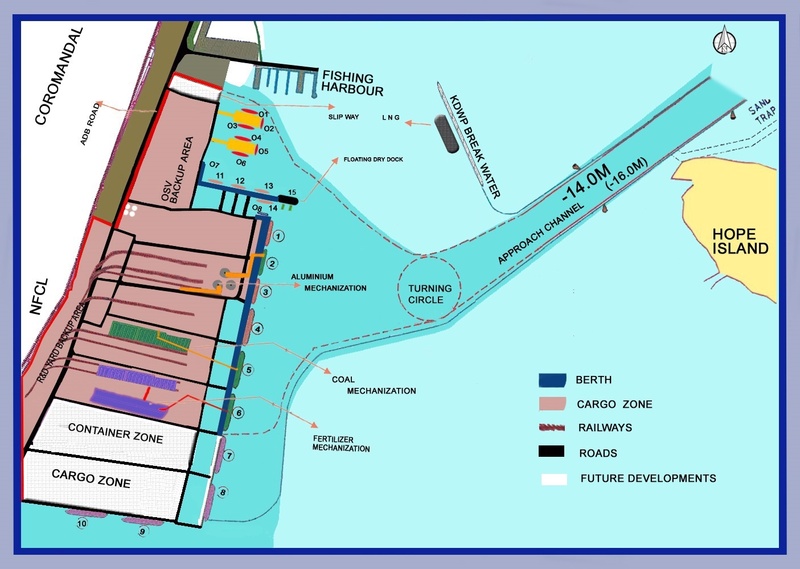 Sembmarine Kakinada Ltd then they can obtain a “No Objection Certificate” from M/S. Sembmarine Kakinada Ltd. Firm to submit the said certificate to KSPL for registration. (a) The firms or Individuals wish to have any two of (a), (b) and (c) as above a consolidated security deposit of Rs.42,000/- is required to be made while there is no change in respect of other in the fees. The firms/individuals wish to have all the three licenses viz :(a), (b) and (c) as mentioned above, Rs.52,500/- is required to be paid as a security deposit while there is no change in respect of other fees. Port users and not hired Vehicles for charge on daily basis. Temp. use by the users. 2.Hired vehicles like Taxies, Tourist cabs etc	-Rs. 35 /-Per vehicle/day. 3. Vehicles for carrying cargo as of Trailers, Lorries, Dumpers etc..
a) Granite Trailers Less than 40` length	– Rs. 80.00/- per Vehicle/day. 4. For Fork lifts, Cranes, Pay loaders & any other – Rs. 55.00/-Per vehicle/day. 5. Temporary pass for driver of the vehicle	– Rs.10.00/- Per day. 7. Auto Rickshaw. Carts, etc. – Rs. 5.00/- per day. NOTE: – 1) Day means in the above context, from midnight to midnight only. Vehicles used by the employees of KSPL are given free passes. 2) Charges are inclusive of all taxes. Note: Charges are inclusive of all taxes. NOTE: 1) Charges are inclusive of all taxes. a) Main Gate b) Operations Dept. c) Accounts Dept. 3) For those customer who intend to avail monthly billing procedure need to submit Weighment charges in advance to accounts dept. and copy of receipt to be submitted at operations dept. for availing services. Note: Performance time to commence 2 hours after berthing of vessel. The decision of KSPL in the matter of applicability of the appropriate tariff for the services rendered shall be final and binding on both the parties and shall not be called in question by the vessel owner / cargo owner or charter. No vessel shall be allowed to sail without clearing off the dues of KSPL in accordance with the invoices raised from time to time and without obtaining the ‘No Objection’ Certificate for sailing from KSPL. KSPL shall have the lien over the cargo and also the vessel for unpaid charges in accordance with the tariff published as above. The tariff may be revised from to time and the revised tariff shall be applicable and overrides the earlier tariff. The vessel owners are advised to check with KSPL for the latest tariff in force before opting to use the services of KSPL. In case of dispute between the parties, the same shall be referred for Arbitration in accordance with the provisions of the Arbitration and Conciliation Act, 1996 and will be adjudicated by a sole arbitrator. The Sole Arbitrator shall be appointed by the Managing Director of KSPL and the other party consents to such appointment and further waives right to challenge the appointment procedure contemplated hereunder. The seat of Arbitration shall be at Hyderabad, where the registered office of KSPL is situated and the Civil Courts in Hyderabad / Kakinada alone shall have jurisdiction to entertain applications under Sections 9 and 34 of the Arbitration & Conciliation Act, 1996. The Hon’ble High Court of Andhra Pradesh shall have the admiralty jurisdiction with respect to common law rights of the vessels calling on port at Kakinada.